You want to know something really unfortunate? My new goals for our home look very much like they did last year. Ok, totally like they did last year. I think I got maybe two things done off of last year's list. I suppose that I just got worn out with life, the universe, and everything. I did get some decluttering done, though not as much as I would have liked. So this year, I have all these ideas that are mainly built on last year's unaccomplished goals. I like to call them "rollover goals." Too many of my everyday to-do lists are like this, which is also unfortunate. The lists for 2015 and 2016 may be very similar, but I'm always getting more ideas so the execution will not be what I originally imagined last year. I also get to mark a couple things off the list, like completing the boys' room. Here's what's next on the list! 1. Storage for the powder room. If I had the money this year, I love to replace the old medicine cabinet with a mirror, put in new lighting, and put in an outlet that's not connected to a light fixture. Since that's not going to happen, especially since we're renting, storage is the next thing this little room needs. 2. New living room chairs. Currently, we have two cheap Ikea wicker chairs and an old, green, $2 chair from the thrift store. The green chair has been nice but it has decided to give out. Like if you sit on it, one side of you falls halfway through the chair. The wicker chairs are better suited for quick seating, not everyday seating. They definitely aren't the chairs you want to sit in for a two hour movie. 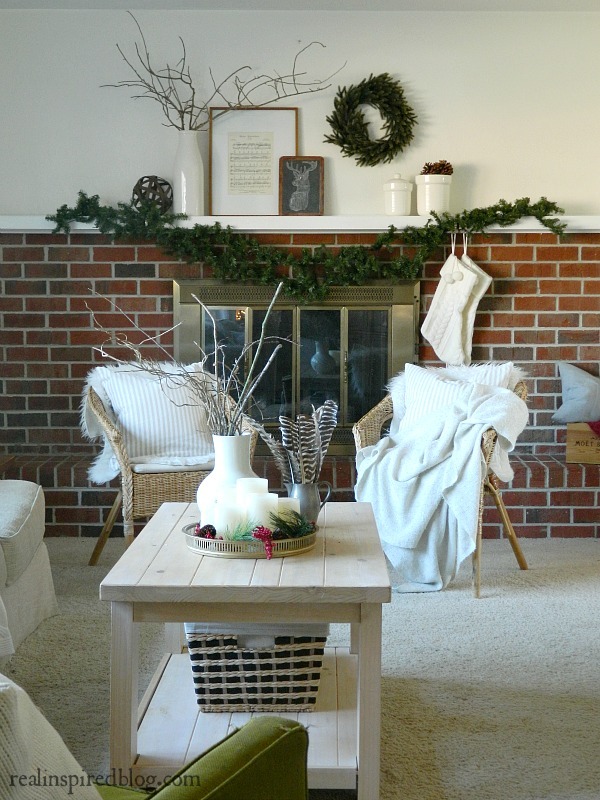 I'd like to splurge on a couple of comfy leather chairs to go in front of the fireplace in place of the little wicker chairs. Hubby has been wanting a recliner but most recliners are made of ugly so I'm hoping we can find a stylish recliner that is still comfortable for his 6'+ self. Even just one leather recliner with a similar chair to go opposite would work. 3. 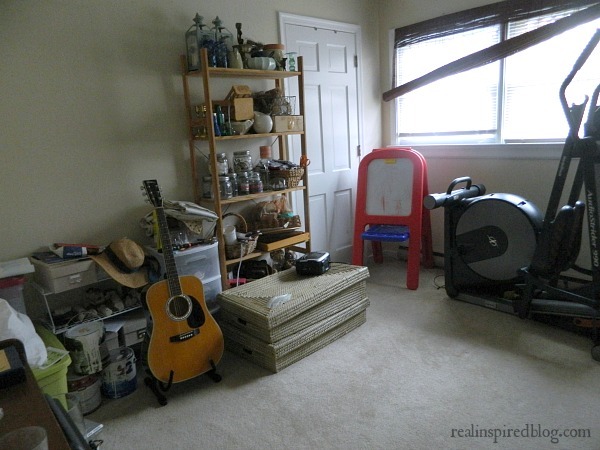 Makeover and organize the exercise/craft room + reading nook. This room has been a process for the last couple years. Little starts here and there, a little decluttering, some more moving of things from one side to the other, but I've never been able to truly have this room finished. This year, I have hope. Ideally, I'd like to have a small table to sew and craft at but, since we want new comfy chairs, that table/desk will probably have to wait. I do have a working layout for the furniture that I do have and plans to paint and hang window treatments. This room also has a little nook which will be perfect to turn into a reading nook for the kids that they can play in while I'm working or exercising. 4. 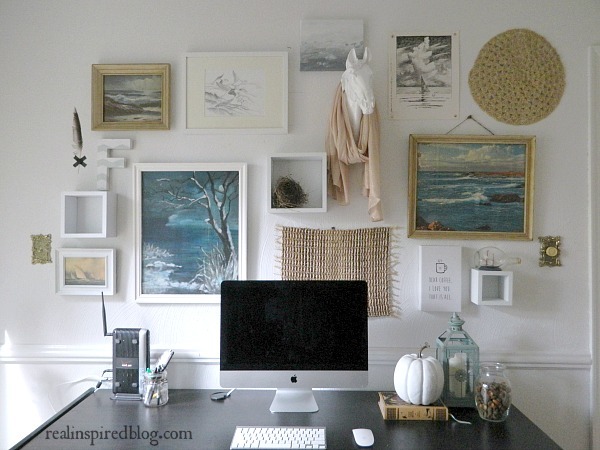 Paint and create a command center in the office/study. I loved this space before we moved the kids' toys in here and had to take down my gallery wall. At the moment, the office isn't exactly pretty. This is the room with most of the books, the computer, and the kids' toys. Everything is packed into this one tiny room. Honestly, I don't have much of a clue what to do with it design-wise and perhaps that's just the stage we have to be in right now, but we do need it to function better when it comes to papers, bills, and keeping track of it all. It's also in desperate need of a new coat of paint. 5. 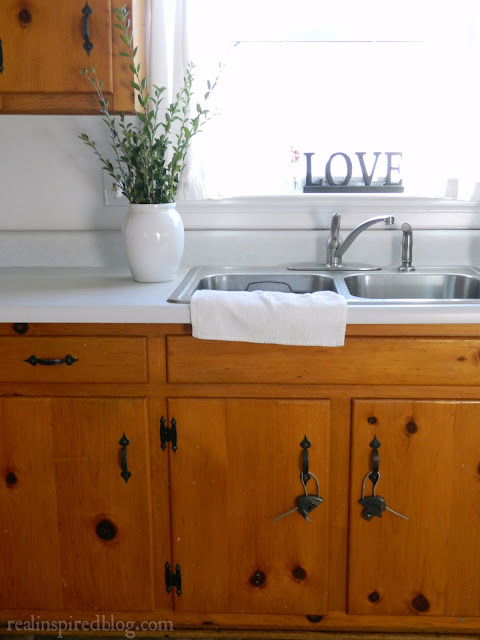 Hang curtains in the kitchen. While the kitchen may not be my favorite space with all those orangey pine cabinets, it has been de-wallpapered and painted, it has a new floor, and it functions well for us. It just needs a bit more softening and a little more personality. I'm thinking a simple gray ticking stripe would work well for curtains but I'm still deciding. I really only have five big goals for 2016. I really want to make some more progress than I did last year! What are your goals for your home this year? It can be anything you want, even if it's hang all your picture frames up. We all have that stack of frames laying around the house!